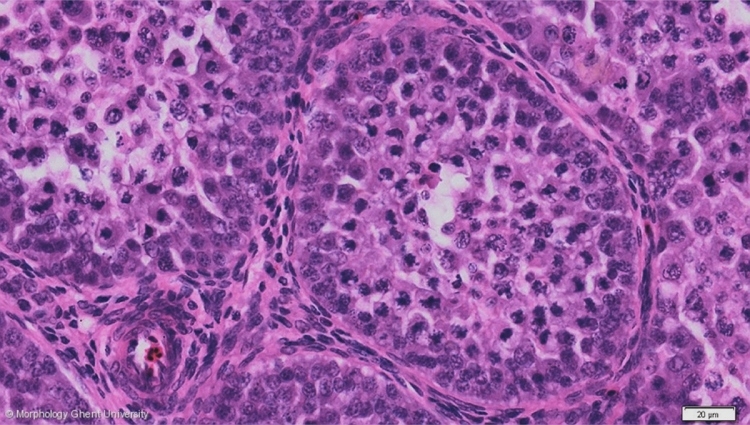 The testis parenchyma consists mainly of convoluted seminiferous tubules (tubuli seminiferi convoluti), separated by scarce connective tissue. The amount of interstitial connective tissue is more significant in the inactive testis but will diminish in the active testis. Interstitial Leydig cells are relatively numerous in the inactive testis. See also: endocrinum. The diameter of the seminiferous tubules outside breeding season is small and not all the spermatogenetic cells are present. In the micrograph above, (the nuclei of) Sertoli cells, spermatogonia, primary and secondary spermatocytes can be seen. Spermatids and spermatozoa are not yet formed. At the entire medial side of the testis, the convoluted seminiferous tubules pass into the straight tubules (tubuli seminiferi recti) which in term lead into the anastomosing channels of the rete testis. The straight tubules are lined by an epithelium of Sertoli cells only.